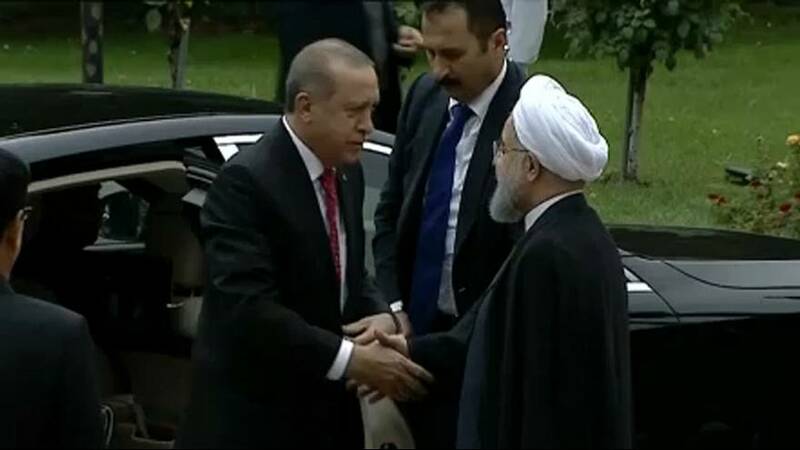 Presidents Rouhani and Erdogan have jointly underscored their opposition to an independent Kurdish state. At a meeting in Tehran, the Iranian leader and his Turkish counterpart said they would not tolerate the changing of borders within the region. Their statements follow last month’s secession referendum in Iraq’s autonomous Kurdish region. “There is not a single country that recognises them aside from Israel and any decision taken with MOSSAD sitting by them at a table can not be legitimate and this is illegitimate,” said Recep Tayyip Erdogan. He added that “Turkey, Iran and Iraq have no choice but to take serious and necessary measures to protect their strategic goals in the region.” The Turkish leader didn’t expand on the comment. Iraq, Turkey, Iran and a number of other countries opposed the vote, which passed with almost 93 percent support, with turnout reported at over 72 percent. “The people of Iraqi Kurdistan are our good neighbours and we do not want to put pressure on them. However, the secession leaders of Kurdistan need to reconsider their decisions,” Hassan Rouhani said. In response to the vote, the Iraqi government slapped sanctions on the region and Baghdad, Ankara and Tehran have held joint military drills close to Iraq’s border.